. :: LYON FEI WORLD CUP DRESSAGE: A LEGEND OF EQUESTRIAN SPORT WINS IN LYON ::. Equita Lyon and its FEI World Cup Dressage stage love the German Rider Isabell Werth, and Isabell Werth certainly loves Lyon! In front of a sell-out crowd, the most decorated rider in equestrian sport won the FEI World CupTM Dressage Freestyle presented by FFE Generali on Friday. "I am delighted and proud of the Emilio’s progress. He now has the confidence and the ability to go even further," explained Isabell Werth. With a group of exceptional horses, the German rider will certainly be one of the favourites for the FEI World Cup Dressage Final, which will take place in the Accor Hotel Arena in Paris from 11 to 15 April 2018. "I have excellent memories of this arena. I can’t wait to go back to Paris Bercy", she added, with excitement in her voice. The Spanish rider Beatriz Ferrer-Salat performed a routine that scored 82.630% to earn second place with her faithful Delgado. The couple was making its return to the FEI World Cup Dressage circuit. "Unfortunately, Delgado was injured during the Olympic Games in Rio. So, we have been away from the arenas for several months. Today, he is in great form. We are back for good,” she said. The Swedish rider Patrik Kittel - one of the regular participants at Equita Lyon and its FEI World Cup Dressage event - finished third on Deja, with an average score of 81.455%. He is also thinking of Paris and the grand final already. "Obviously, the FEI World CupTM Dressage Final is one of my objectives for the season. I really hope I will be going to Paris. Beyond the competition, it is a city I really love," smiled the Scandinavian rider. So the date is in the diary for the finals in Paris. 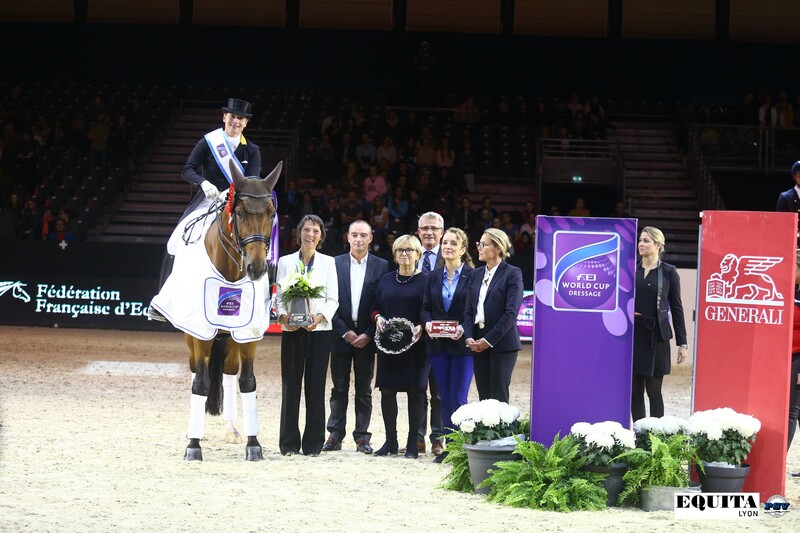 "We look forward to welcoming these riders again for the World Cup Final at the Accor Hotel Arena, the second final to be organised by GL events after the one in Lyon in 2014,” said Sylvie Robert, Director of Equestrian Events at the GL events Group. The French rider Ludovic Henry also hopes to be involved in the Paris final, after finishing twelfth with a score of 72,150%. "At the present time, we are taking the each competition as it comes. Of course, as French rider, taking part in the final would be a great honour," he said.